LEN - www.lankaenews.com | P.M. makes 7 requests to entrust law and order ministry to Fonseka : Sirisena has secret talks with Mahinda instead ! 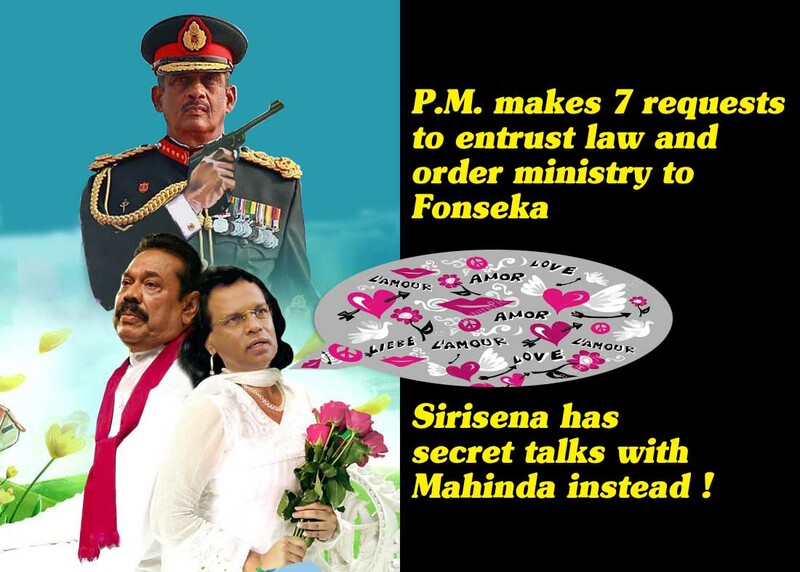 P.M. makes 7 requests to entrust law and order ministry to Fonseka : Sirisena has secret talks with Mahinda instead ! (Lanka-e-News - 04.March.2018, 11.45PM) It is President Maithripala Sirisena now begging on a 4 % but has never stopped his bragging who loudly and proudly declared prior to the last local government elections that he would send all the crooks and culprits to hell after the 10 th of February , has once again refused to entrust the ministry of law and order to Field Marshal Sarath Fonseka. Ranil Wickremesinghe P.M. has addressed five letters to the president requesting to allocate the ministry of law and order to Fonseka while specially mentioning it is ‘the expectation of my party , mine and the people that Fonseka is given that portfolio.’ The P.M. has even made two requests to the president when he personally met him. Yet the president has not responded in that favor , based on reports reaching Lanka e news. After his return from his tour of Indonesia , Fonseka had met with the president and discussed this subject . The president however has said, several high rung officers of the police are against Fonseka’s appointment. The Field Marshal had at once replied , such opposition is understandable since there are several police chiefs who are engaged in extortion and heroin business who would certainly not like him (Fonseka) being appointed as law and order minister. Fonseka has told the president , personally he is prepared to accept any portfolio but because his aim is to do a thorough and clean job, he desired the law and order ministry . The president who had no valid grounds to defend himself any more had kept quiet. Maithri , S.B., and Dudley had phoned Basil , but the latter snubs them - has not answered ! President Sirisena who is now begging on a 4 % , has phoned Basil Rajapakse several times without avail ; latter had not responded. Thereafter, S.B. Dissanayake and Dudley Sirisena have also tried to contact Basil, but he had not answered any of their calls too. It is the stance of Basil , there should be no truck with a betrayer like Maithri . (A serpent that gobbles eggs is safer than a village politico who gobbles hoppers). The last victorious election campaign was led by Basil Rajapakse . Namal Rajapakse too lent support. It was on condition that Gotabaya is kept out of the campaign , that Basil undertook the election campaign. He had asserted he cannot conduct the election campaign together with Gotabaya’s racist group , and therefore made a request that Gota should be in America until the elections are over. So Gotabaya was packed off to America until the elections were over. Be that as it may , Sunday Times newspaper reported on the 4 th , that Maithri and Mahinda had met at a secret venue and had discussed for over two hours , though what was discussed is unknown. Based on reports reaching Lanka e news , it is Gotabaya and Dudley Sirisena who have acted as mediators for the meeting of the duo- Maithri -Mahinda best known for worst betrayals and double crossings . Between them double crossing each other is one thing , but double crossing those who trusted in them is another, and much easier. Gota of course maintains a close relationship with the Sirisena family . We shall reveal details of this relationship and why , in a later report . Going by all these murky and clandestine activities of the president , what is deducible is , 4 % begging president is not giving the law and order ministry to Fonseka , in order to curry favor over with the Rajapakse camp. Of what earthly use is a consensual govt. ? It is time the UNP leader gave careful thought to the factual situation : When his party has the majority of the seats in parliament ; and he is the P.M. and UNP is his party , of what purpose is a consensual government if a minister of his own party cannot be appointed ? Besides, what purpose is it going to serve him by swallowing silently all the indignities he is subjected to already , and the foul mouthed utterances of his party members, thereby allowing his popularity to be undermined . Hence , it is high time he asked himself why he should carry on a consensual government with Sirisena the villainous , vicious, double crosser ? Is it to incur the wrath for the sins and vices others are committing abusing their political power and position? It is a well and widely known fact , Sirisena is now embattled, devastated , and hopeless after transforming into an enemy of the people by making all the false promises before presidential elections to the masses solely and wholly to secure the post of president. It is also crystal clear , Sirisena rightly dubbed Sillysena, who is now in his political death throes because of his own imbecility , idiocy and insanity fits is in his utter desperation seeking to ingratiate himself into the favor of the Rajapakses ( confirmed crooks and culprits) in order that at the next presidential election he can contest as an SLFP/ UPFA /Flower bud common candidate along with their support.